“Severe turbulence rocks OC-Seattle flight, causing injuries, diverted landing,” shouted the headline from Los-Angeles based KABC. “3 on Delta flight sent to hospital after turbulence forces emergency landing in Nevada,” screamed another. ‘We did a nose dive, twice’: Three sent to hospital after Delta flight makes emergency landing.” blared yet another headline. While there were indeed five injured people, two declined to be transported to the hospital after being examined by paramedics. Three were sent to the hospital and later released the same day. One of the injured parties was a flight attendant. The incident occurred during snack service, when the flight attendants are on their feet. If the pilots have advance warning of rough air, they will have the flight crew be seated and meal/snack service will be suspended. In this case, it was Clear Air Turbulence (CAT). CAT occur without warning. While pilots are trained in CAT response procedures, the unpredictable nature of CAT makes it impossible to plan ahead, especially if there are no previous pilot reports or warnings from other pilots flying in the same area. Despite the sudden, unpredictable nature of CAT, flight crews swing into action immediately, even in the face of upended meal carts, panicked passengers, and debris strewn about the cabin. Flight crews train for these scenarios repeatedly. The injured passengers were in the path of food items that were jarred loose from the meal cart, or they weren’t buckled in at the time. All passengers walked off plane under their own power when it landed in Reno, NV. In other words, while CAT may seem out of the ordinary, the first responder presence was not, because it is a part of standard operating procedure for an emergency landing with injured passengers on board. 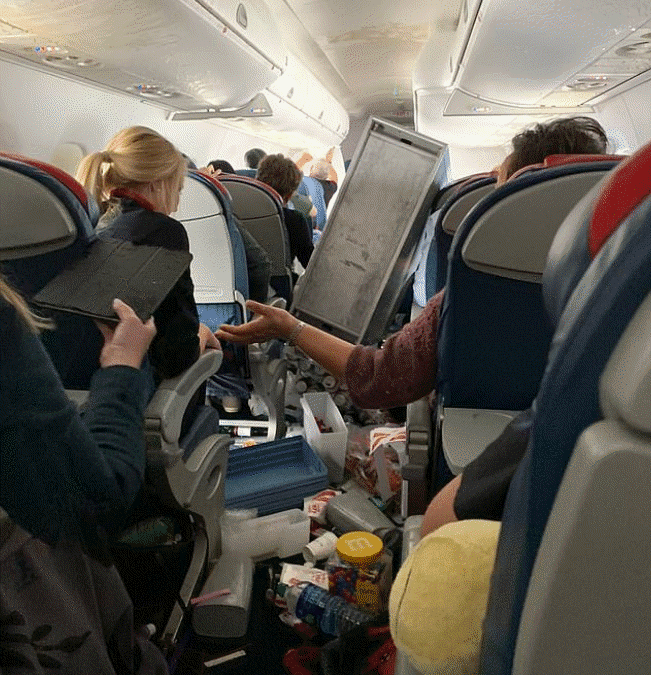 Injuries in CAT are sustained in several ways: passengers or flight crew not buckled in (in the case of flight attendants performing meal service or passengers who were unbuckled at the time) passengers or crew struck by loose items in the cabin, or by having an infant or child playing in the aisles when the CAT strike. According to Capt. Ron’s Expert Turbulence & Takeoff Guide, turbulence are a normal phenomenon in the course of air travel. In the meantime, images shot by passenger Joe Justice not only show the post-CAT chaos, they also show passengers comforting one another and looking after each other as the plane headed to Reno, NV. There is one positive take-away from this story: people can and will look after one another when the friendly skies become unfriendly; it’s a part of human nature, and a news element the press will overlook in favor of sensational headlines. While we can’t control when turbulence (including CAT) will occur, we can control how we respond to them. We can do this by learning coping strategies educating ourselves, and preparing in advance for our flights, just as flight crews do. Once we understand the ins and outs of air travel, those blaring news headlines will fade away from our consciousness for good. Need a little help shaking off the media hyperbole? Reach out to Capt. Ron today for a free 15-minute coaching call.